Chocolate Hazelnut Swirl Cheesecake with a hazelnut crust. Yum? I wanted to make a cheesecake that incorporated chocolate in it, but wasn’t too chocolate-y [technical term]. Oh, and I wanted to add nuts in it. 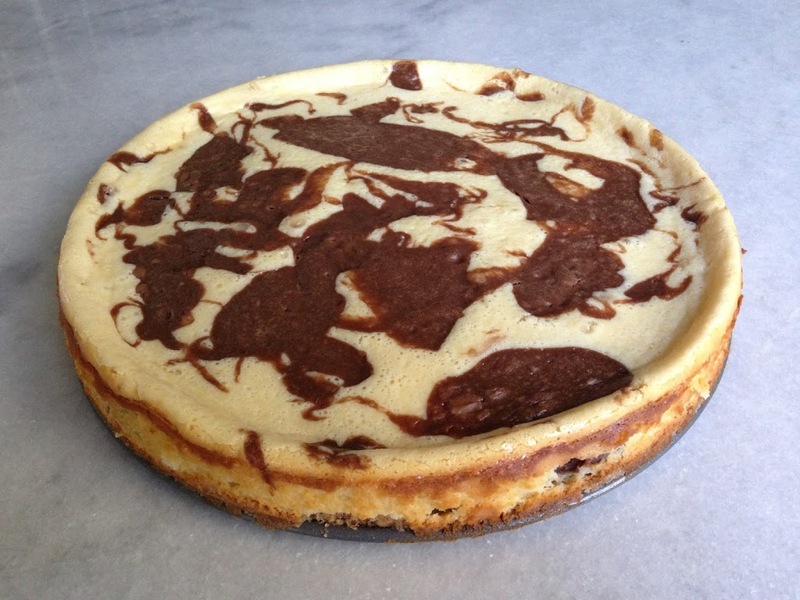 I remember coming across a lot of nutella cheesecakes, but because I didn’t want the whole thing to be chocolate… I decided to add in swirls of it. I LOVED the pistachio crust that I made for my cheesecake with the chocolate center filling, so I decided to use hazelnuts in the crust in today’s cheesecake. Preheat your oven to 350 degrees [and place your oven rack in the middle of your oven if it isn’t there already]. Lightly grease a [non-stick] springform pan just to be extra careful. In your food processor: add in the flour, brown sugar, and chopped hazelnuts. Pulse several times to combine those three ingredients before adding in the cubed butter. Pulse several more times until the butter is incorporated in nicely. Firmly press the crust mixture into the bottom of your springform pan. Bake for about 12 minutes [in your preheated oven] [or until the edges are light brown]. Remove from oven and let the crust cool completely. At this point, lower the oven temperature to 300 degrees to bake the cheesecake. In a large bowl, beat your cream cheese until it is smooth. Gradually beat in sweetened condensed milk. Add in your eggs and vanilla extract. Do not over beat the mixture, just beat it until your mixture is smooth. In another bowl, separate about 1 and 1/2 cups of the cream cheese mixture. Add in the Nutella to the smaller batch and mix it. On top of your [baked and completely cooled] crust, pour about half of the yellow cheesecake batter. Next, pour about half of the chocolate hazelnut batter on top of the yellow batter. Repeat the layers. Originally, I planned on swirling the batter from the top to give it a marble cake look, but when I poured the final chocolate hazelnut batter on top… it looked so pretty as is that I left it as it was. Place cheesecake in the center of the middle oven rack [in the preheated 300 degree oven]. Bake for about 50 minutes, or until edges are light brown and center is almost set. At this point, I turned my oven off, but left my cheesecake in the oven, with the door open for about 30 minutes so the center could completely set. At that point, I removed the cheesecake from the oven to let it cool. The hardest part. Oh well, it will just be that much better tomorrow. Thank you! I recommend trying it out – easy to make and it&#39;s delicious! OH.MY.GOODNESS! My mouth is watering. I just LOVE any kind of cheesecake…and nutella too. What a perfect flavor combo this lovely dessert is. Thanks so much for sharing at Weekend Potluck. We&#39;d love for you to link back on your post. Enjoy a relaxing weekend. Crystelle, The Better Baker, and Shannon – thanks! the combination is amazing! I love the crunchy hazelnut base with the melt in your mouth cheesecake part! It looks delicious, I&#39;ve had a springform pan for years but have been too intimidated to use it! That looks and sounds so delicious. I am a new follower. Anyonita: thank you!<br /><br />Margo: thank you! Use the springform pan! I actually prefer them for baking regular cakes as well because taking them out of the pan is so much easier!<br /><br />and Kat: thank you! You had me at cheesecake and then again at chocolate! Donna, definitely try it out! It&#39;s easy to make… and melt-in-your-mouth delicious. Totally all over this! Cheesecake is one of my downfalls! Totally pinned and featured at Wicked Good Wednesdays this week. Thanks for sharing! OOOh sounds delicious and I love the idea of hazelnuts in the crust! Thanks so much for sharing on Busy Monday! This looks yummy! Thanks for linking up for Friday Favorites. I&#39;m featuring you this week!